They are or will be among the best paid players in the League but don’t deliver as expected on the court, let’s take a look at our top 5 most disappointing franchise players. Formerly one of the most entertaining players in the League, Griffin’s last 70+ games season dates back from the 13-14 campaign. Since then, his level has slowly decreased to reach this year ceiling. After having signed a 5 year $173 million contract, Griffin was having probably his worst year with 44% FG down from 49% the previous, probably due to the departure of Chris Paul. Since then, the Clippers gave up by trading him to the Pistons. 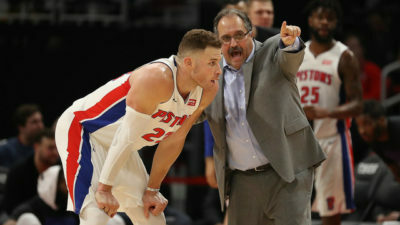 He hasn’t played 60 games this season, keeps going away from the basket with a career high 5+ 3pt attempts per game and has averaged less than 20pts since joining the Pistons as he will probably miss the playoffs for the first time since his rookie season. A franchise player is supposed to make his team win, but New York has not been better as Porzingis has become the main man. On offense, the lanky 7-3 forward just wants to shoot and avoids contact as much as possible if he can’t just dunk the ball. Despite his very good 39% 3pt, he’s shooting just 45% inside the 3pt line, mediocre stat for someone with his size and athleticism. On defense, he’s what I would call a fake defender. He’s averaging 2.4blks per game but is not protecting the rim like a defensive anchor as he hates physical contact and grabs only 6.6rbds in 32min. Kristaps needs to be tougher, on defense and offense, or he will be NYC next favourite loser. The former draft #1 pick was supposed to be one of NBA next superstars. With Butler’s arrival, it’s not surprising to see his scoring stats decline, yet we expect more efficiency from such a physical freak. Wiggins has not improved that much on offense, shooting just 44% FG, 33% from 3 and 64% FT. He also has the tools to be an elite defender but is even more disappointing with only 1.1stl and 0.6blk per game. We hope the fact he signed a 5 year $146 million contract has not put him into an early retirement and that he will benefit from Butler’s presence to develop into the two way player he’s supposed to be. Don’t believe the hype! After four seasons with the rising Warriors, Barnes signed a 4 year $94 million max contract with the Mavericks who expected him to be their new franchise player. Well, even if he’s not supposed to do it all by himself, let’s say that he’s far from that in a very competitive Western conference. Over the last two years, Dallas has a combined 56-103 record while Barnes has taken part to more than 150 games. Basically, he’s just putting offensive stats at an average rate with 19pts on 45% FG including 36% 3pt. Like the players scouted before, his defense is mediocre with 0.2blk and 0.7stl, despite great tools to be a versatile defensive force on both forward spots. When I started writing this article, I didn’t think about Millsap. He’s a player I like, who has always been consistent and put good stats. Then I read about his $90 million contract over three years. Contrary to the players I have criticized before, I don’t blame as much Millsap as I blame Denver for offering this deal. Millsap has never averaged more than 18.1pts and 9rbds, and it was not the same year. the aging forward is already 33 and only the 5th best scorer on his team while he has only played 33 games.